On 22 April 1918, Knocknagow (Ireland: FCOI, 1918) opened at Dublin’s Empire Theatre after a tour of many of Ireland’s towns and cities. 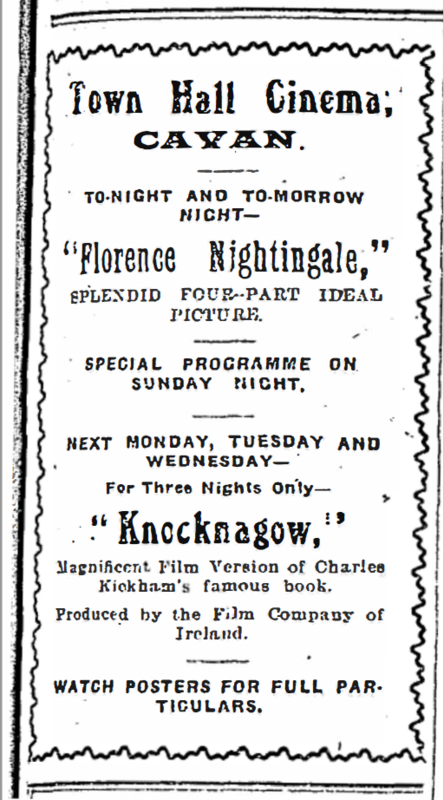 Ad for Knocknagow in the Irish Limelight Feb. 1918: 10-11. Tailor Phil Lahy (Arthur Shields) fits out Mat the Thrasher (Brian Magowan) for a new coat in Knocknagow. Image and essays on the film available here. One of the things he would likely have thought is that the film was very selective in what it took from the novel. “The story meanders along through over six hundred pages its placidity disturbed by very little of what the playwright dubs ‘action,’” the Evening Telegraph critic JAP noted of the novel in his review of the trade show. J.M. Carre as the villainous land agent Beresford Pender. Pender’s eviction of the Brians, a farm labouring family, is depicted in detail, with titles superimposed on the images of the land agent dancing before their burning cottage. Apart from transposing a bestselling Irish novel into an accessible screen format, two other definitions of “national interest” seem to be particularly relevant to thinking about the release of Knocknagow in early 1918: the commitment to local exhibition and the politics of Irish nationalism. The first of these is illustrated by the fact that the trade show had, unusually, followed rather than preceded a special premiere run in Clonmel from 30 January to 2 February, and the film’s first run after the trade show would not be in the cities of Dublin or Belfast but in Carlow on 18-19 February. The Clonmel opening was designed to acknowledge that the film had been shot almost entirely in the Tipperary locations of Clonmel and Mullinahone associated with Kickham’s source novel. However, given that audiences not only in Clonmel and Carlow but in many other small towns saw the film before it opened to the public in Dublin on 22 April underscores FCOI’s commitment to a definition of national interest that associated it first and foremost with small-town Ireland. The importance of the Tipperary landscape is emphasized at several points of the film, including a sequence of iris shots in which Mat says farewell to Ireland as he makes ready to emigrate. Other aspects of the exhibition of Knocknagow deserve discussion, but the 22 April opening date of the film in Dublin also marked a turning point in Irish national politics. That day was flanked by two days of demonstrations against the conscription of Irish men into the British army. Sunday, 21 April represented a particular Catholic church influenced protest, with mass meeting and fiery speeches in every parish in the country, while Tuesday, 23 April was the day chosen by trade unions for a general strike that meant, among other things, that “there were neither newspapers nor cinema shows” during a “universal cessation of work throughout Nationalist Ireland” (“Labour’s Protest”). The British government’s determination to extend conscription to Ireland would finally succeed in uniting the warring factions of Irish nationalism against it. Newsreel special of the by-election in South Armagh, Dublin Evening Mail 4 Feb 1918: 2. This turning point of the conscription crisis came after the film’s release in much of the country, however, and it was in a political context of the rise of Sinn Féin that the film was produced and initially exhibited. In late 1917 and early 1918, the long stable link between the achievement of nationhood and the Home Rule of the Irish Parliamentary Party (IPP) was severely under threat from the vision of a more radical independence offered in the wake of the 1916 Rising by the new Sinn Féin party. The set pieces of this struggle from the time Knocknagow began shooting in Tipperary in the early summer of 1917 and through the period of its exhibition in late winter and spring 1918 were a series of six by-elections in which Sinn Féin ran candidates in constituencies where the IPP had previously held Westminster seats, winning three of them. After losing four seats in all to Sinn Féin in 1917, the IPP may have seemed to be regaining the momentum by winning the three by-elections in early 1918, but one of these included the Waterford seat left vacant by the death on 6 March of the man most associated with Home Rule, IPP leader John Redmond. 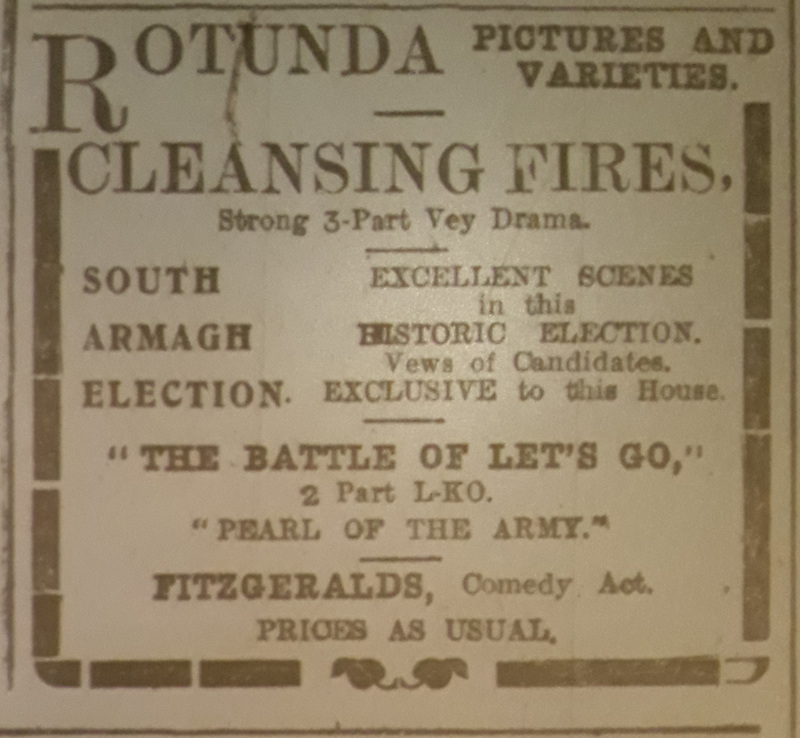 Cinema audiences could follow these developments through the newsreel footage of the by-elections and Redmond’s funeral provided by Irish Events and exhibitors such as William Kay of Dublin’s Rotunda who filmed these events. General Film Supply sought sales of its film of the Funeral of the Late John Redmond, M.P. beyond its usual Irish Events network by placing this ad with the entertainment ads in the Evening Telegraph of 11-12 Mar. 1918. As well as these party-political events, Knocknagow was released in a country that was experiencing increasing incidents of local unrest of many kinds, with a large number of prosecutions for cattle driving and for illegal drilling by Irish Volunteers, as well as a hunger strike by Sinn Féin prisoners in Mountjoy Jail. In early March, County Clare was placed under martial law, and Major-General W. Fry issued a proclamation “prohibiting the holding of any meeting or procession within the Dublin Metropolitan Police Area between March 6 and March 27,” a period that included St. Patrick’s Day (“Proclamation”). In one high-profile case, men arrested for illegal drilling in Dundalk refused to recognize the court and sang “The Soldier’s Song” to disrupt proceedings. This tactic became so common that one defendant (Michael Murray) in a Clare cattle-driving case refused to recognize “this concert” (“Court Scene”). However, when during the Dundalk case, a variety company sang the same “Sinn Féin” songs at one of the local picture house, a section of the audience left in protest (“Round Up”). More seriously, members of an audience at Limerick’s Tivoli Picture House on 4 March became victims of violence when 15 to 18 soldiers who had been involved in running battles with young men in the street burst into the auditorium and attacked the crowded audience at random with sticks and truncheons, injuring many, including the musical director (“Soldiers & People in Conflict”). 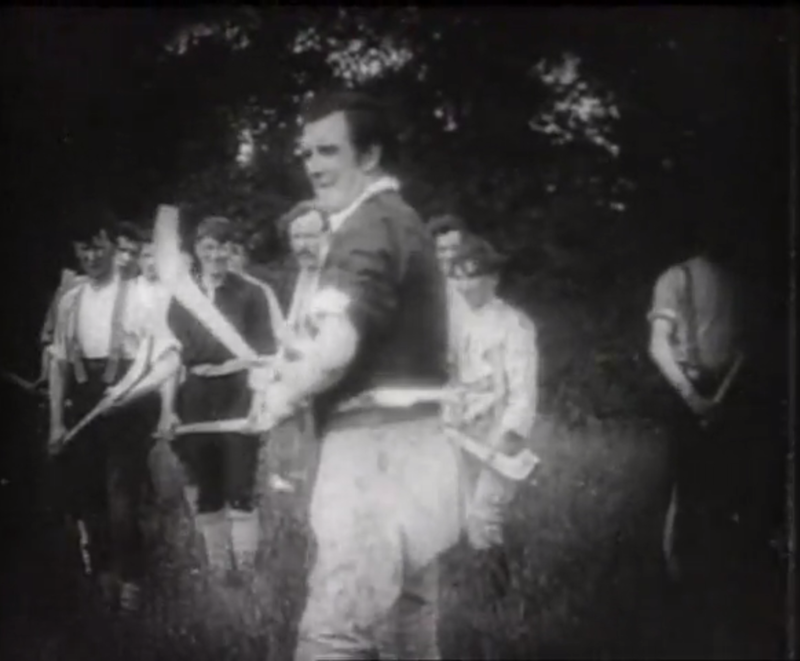 Mat leads the Knocknagow hurling team for a match that the Derry Journal reviewer thought was “a topsy-turvey affair, resembling a rugby scramble more than a game of caman” (“‘Knock-na-Gow’ at the Opera House”). Some more on that aspect of the film here. In these circumstances in which, it seems, politics could irrupt into the auditorium at any moment, Knocknagow looks like quite an indirect, even tame intervention. The FCOI’s choice of Kickham’s novel as the basis for its first landmark film seems, on the one hand, an overtly nationalist statement: its author was a former president of the Irish Republican Brotherhood and one of the best known Irish revolutionaries of the latter half of the nineteenth century. On the other hand, the nature of the book – rich in detail of Irish country life in the 1840s but also sprawling and sentimental rather than overtly political – was such that it could be adapted without courting political controversy. As such, the film contrasts with the films made in Ireland between 1910 and 1914 by US filmmakers Sidney Olcott and Gene Gauntier for Kalem and subsequently their own production companies, some of which openly feature armed political rebellion against Britain, albeit that these films are also set in the past. ArthurO’Connor and Mary Kearney pursue their romance. This is not to argue that FCOI was politically conservative but that the company had to negotiate strict censorship. The attempt to show Ireland a Nation (US: Macnamara, 1914) in Dublin in January 1917 or even the more recent controversy over the potential banning of the Finn Varra Maa pantomime had shown that to have produced a film that the authorities judged to have been overtly nationalistic would undoubtedly have been to see the film immediately banned under the particularly strict wartime censorship provisions of the Defence Against the Realm Act. Apart from anything else, the banning of Knocknagow would have been a financial disaster for the already struggling FCOI. 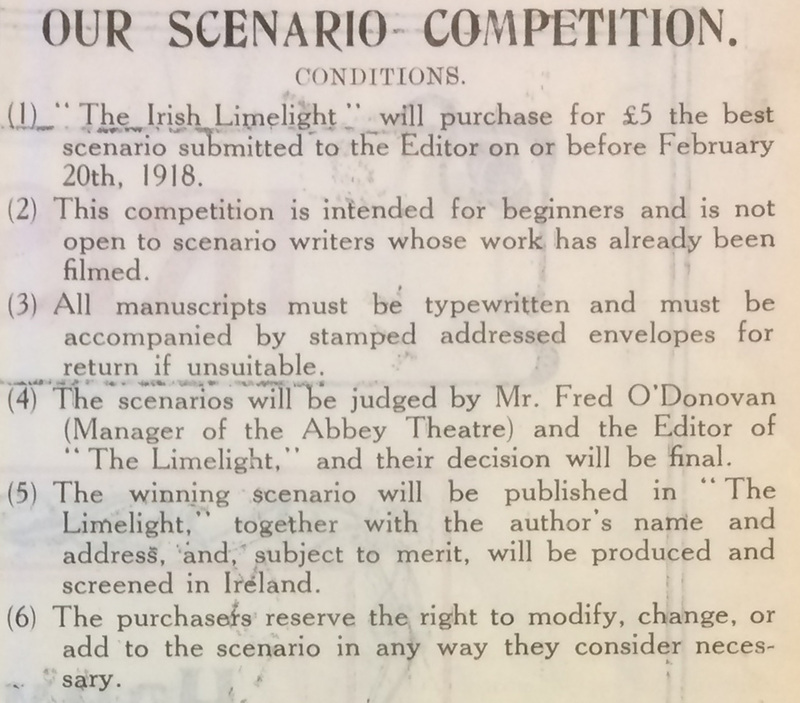 Scenario competition in Irish Limelight Dec 1917: 11. In this context, Kickham’s work took on a renewed importance in its ability to subtly re-articulate a familiar set of representations in a political way through its association with the author’s republicanism. Despite its setting in the mid-19th century, Knocknagow still resonated with Irish audiences, as the popularity of the stage adaptation shows. And 1918 would be the year of Kickham film adaptations: with a similar setting in time and place, Kickham’s other major novel Sally Cavanagh would be adapted by J. A. McDonald for a scenario competition run by the Irish Limelight in early 1918. Given that Knocknagow’s director Fred O’Donovan joined Limelight editor Jack Warren in judging the competition, it is perhaps not surprising that McDonald’s scenario, Untenanted Graves, won, but its seems never to have been produced (“Untenanted Graves”). 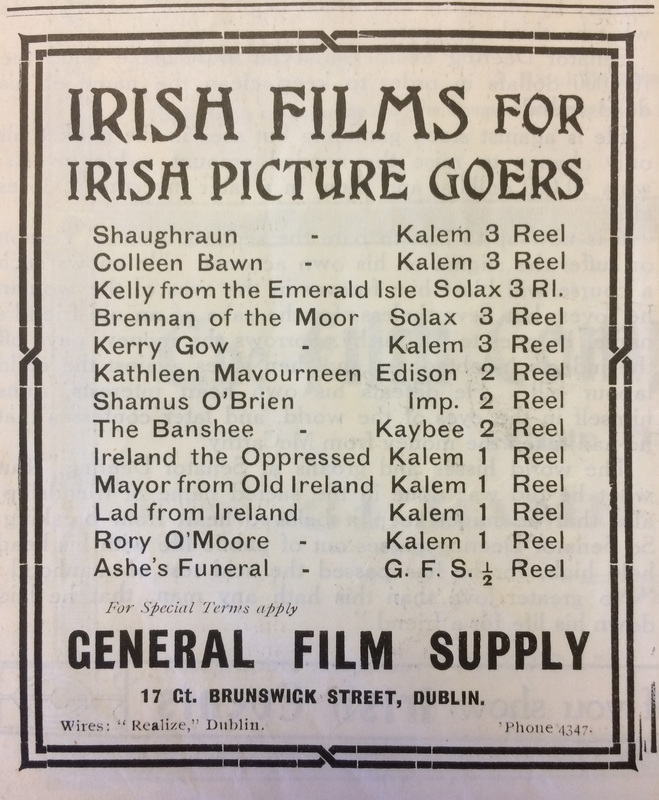 Films made in Ireland by US filmmakers Sidney Olcott and Gene Gauntier for Kalem dominated this list of Irish films available to Irish exhibitors through Dublin-based General Film Supply; Irish Limelight Dec. 1917: 18. 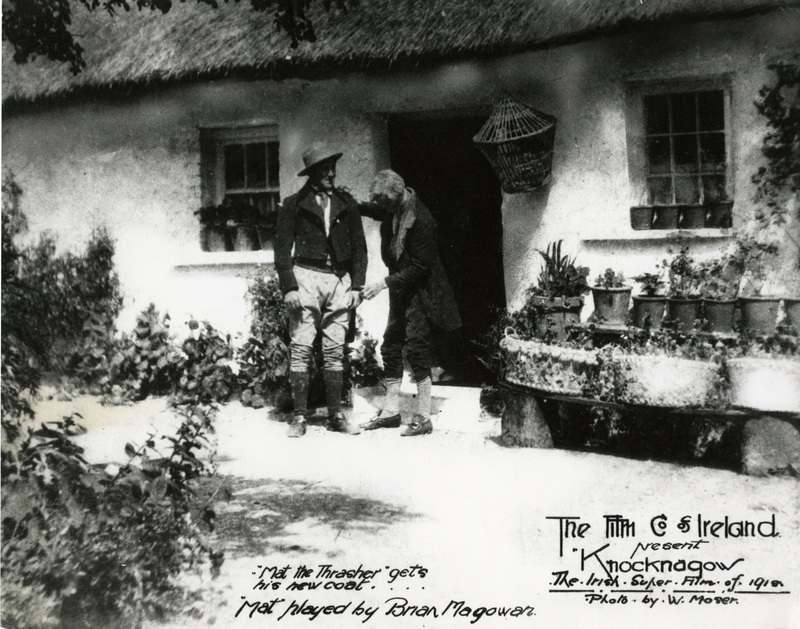 As the Kickham film that was made, Knocknagow in itself, and in the company’s rhetoric around it, emphasized its embeddedness in particular Irish locations that were different from the ones popularized by previous, foreign filmmakers in Ireland, especially the Killarney of the enduringly popular Olcott-Gauntier films. Unlike Olcott and Gauntier, the FCOI filmmakers were – predominantly – Irish born, and the company was based in Dublin. In keeping with this rhetoric, local exhibition was of more than usual importance to Knocknagow. FCOI had opened previous films in regional picture houses, despite the claim by the Dame Street Picture Theatre in Dublin that all the company’s productions could be seen there first. But for Knocknagow, regional exhibition was a part of its national significance. 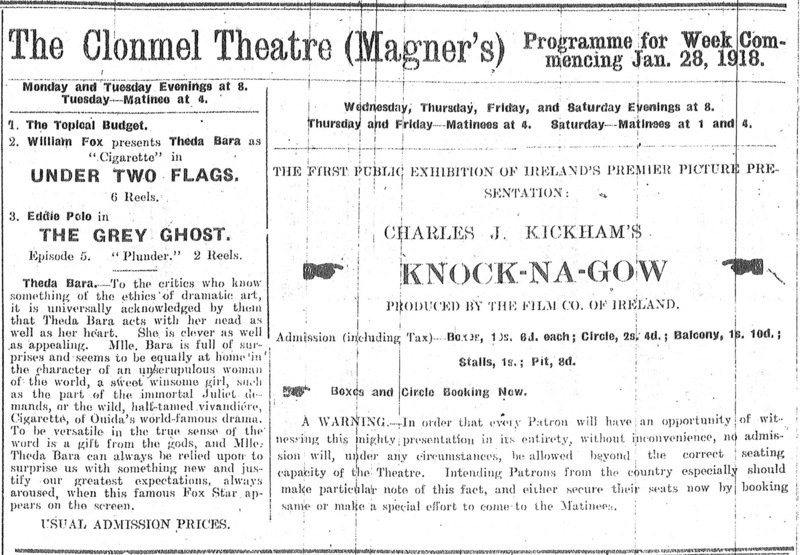 Ad for premiere of Knocknagow at Magner’s Theatre, Clonmel; Nationalist 26 Jan. 1918: 6.
we are receiving return bookings—a remarkable thing in the case of a picture, though very ordinary in that of a play or opera. For instance, the city of Limerick gave us four bookings, and I question if any other picture every received over two. The same is true of Waterford, Clonmel, Cork, Carlow, and other towns. This week we are breaking all records in Waterford. I mention these facts to indicate that there is prospect of promise and permanency in our enterprise. The ad for Knocknagow at Derry’s Opera House was dwarfed by an ad for the opening of the city’s newest picture house, the Rialto, on 29 April. Derry Journal 12 Apr. 1918: 2. Although the surviving evidence in Ireland’s regional newspapers does not quite support Sullivan’s attempts to boost Knocknagow in advance of its Dublin opening, the film had been shown – or in the case of Limerick, was about to be shown – in the towns he named. To clarify, before its week-long run at the Empire Theatre in Dublin (22-27 Apr. ), the film was shown at Magner’s Theatre in Clonmel (30 Jan.-2 Feb.), the Sackville Picture Theatre in Dublin (trade show, 6 Feb.), the Cinema Palace in Carlow (18-19 Feb.), the Town Hall Cinema in Cavan (25-27 Feb.), the Cinema in Kilkenny (6-7 Mar. ), the Opera House in Cork (18-23 Mar. ), the Coliseum in Waterford (1-6 Apr. ), the Opera House in Derry (8-13 Apr. ), the Empire Theatre in Belfast (15-20 Apr. ), the Shannon Cinema in Limerick (15-17 Apr.) the Picturedrome in Tralee (18-20 Apr.) and the Town Hall in Galway (22-24 Apr.). Anglo-Celt 23 Feb. 1918: 7. A survey of the reception of Knocknagow in the run up to the Dublin opening has shown something of the way in which the film resonated with audiences around the country. It makes clear that the film was certainly popular with Irish cinemagoers, with local critics consistently praising its fidelity to Kickham’s novel, the quality of the acting and the beauty of the Tipperary scenery. However, few reviews mentioned the film’s contemporary political relevance. 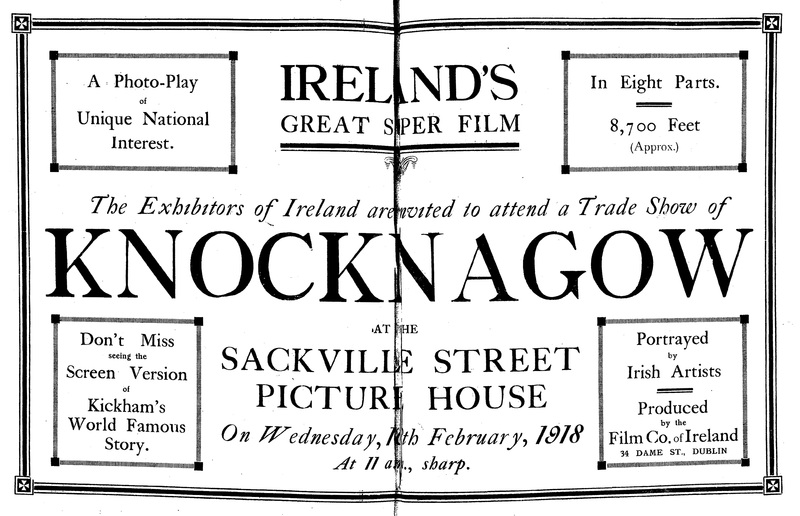 Indeed, some suggested that audiences abroad would be particularly impressed by the film, including the Anglo-Celt‘s reviewer, who subtitled his/her notice “A Picture Play that Will Create a Furore in America” (“‘Knocknagow’ on the Film”). 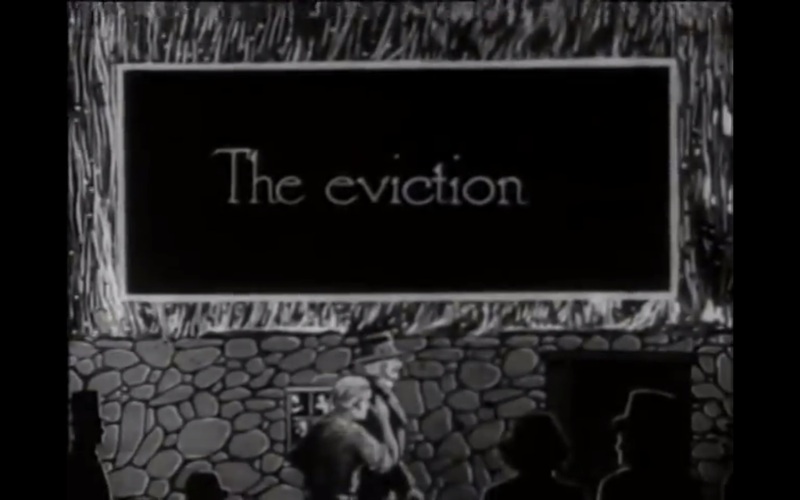 An illustrated intertitle introduces the eviction scene, emphasizing its importance. By the time this reviewer was writing on or about 26 April, conscription had become the politically unifying issue for nationalists that it had not been earlier in Knocknagow’s run. While FCOI could not have foreseen such events, the company enhanced its connection to the local audience in many of the places Knocknagow was shown by having members of the cast sing at screenings. This was a unique feature of the film’s exhibition in Ireland. Film actors had on rare occasions attended screenings of their films, but they did not contribute to the events’ live music. Brian Magowan, the film’s main star and an actor familiar with musical theatre, appeared most often, regularly accompanied by fellow cast member Breffni O’Rourke. This was not Magowan’s first vocal accompaniment of a FCOI film; he had sung at the premiere of the company’s first film, O’Neill of the Glen. 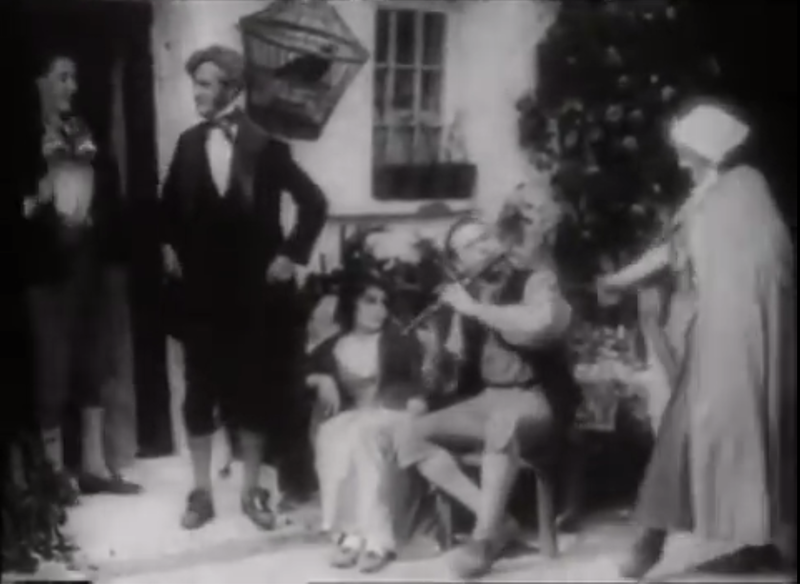 In the case of Knocknagow, however, the FCOI gave this feature special prominence by having Magowan and O’Rourke, dressed in character, sing folk songs connected with the film. Although they did not appear at every venue where the film was shown, and of course, they could not have when the film was showing simultaneously in geographically remote locations, Magowan’s and O’Rourke’s live appearances were regular features of the first run of the film in Ireland. While ploughing a field with a view of Slievenamon (mountain), Mat pauses to sing “The Farmer’s Boy,” with an intertitle helpfully providing musical notation and the song’s refrain. Their earliest appearance seems to have been in Cavan, where the Anglo-Celt reported that “[a]n interesting feature of the entertainment was that Mr. J. McGowan, who, as ‘Mat the Thrasher’ was the hero on the film, appeared each evening in the flesh and sang some old Irish ballads in very charming voice, while Mr. Breffni O’Rourke (‘Bill Heffenan’ in the play) gave some traditional Irish lays and witty stories” (“‘Knocknagow’ on the Film”). Magowan most important contribution was “Slievenamon,” a song about the Tipperary mountain whose lyrics Kickham had composed. The centrality of this song to the FCOI’s conception of the ideal accompaniment of the film is underlined by the reproduction of Magowan’s arrangement of the song for voice and piano that was included in a programme for a later (probably 1919) run of the film (NLI). The film has many musical scenes, including this one in which Billy Heffernan plays the flute while the Lahys dance. The reviews are unclear on whether they sang before, after or during the projection of the film, but the film itself includes moments that motivate vocal accompaniment. 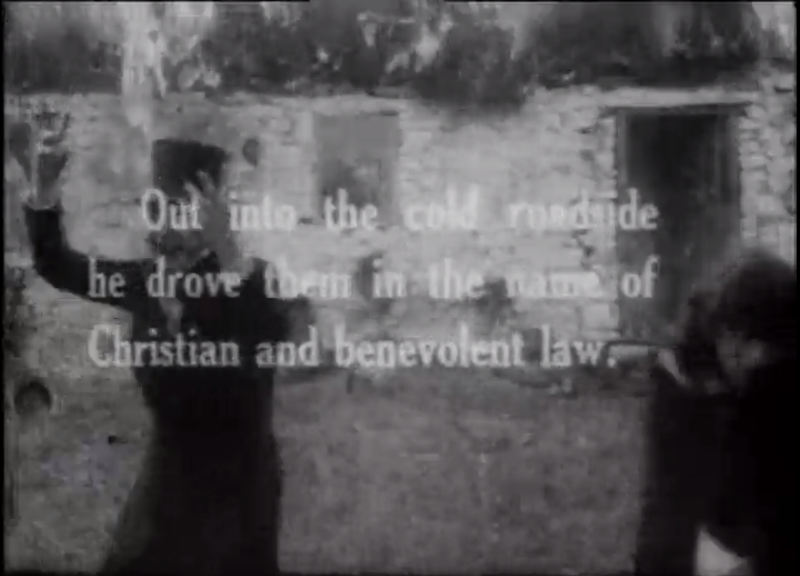 In an early scene of the film, Mat is introduced by an intertitle and then shown ploughing a field in long shot. 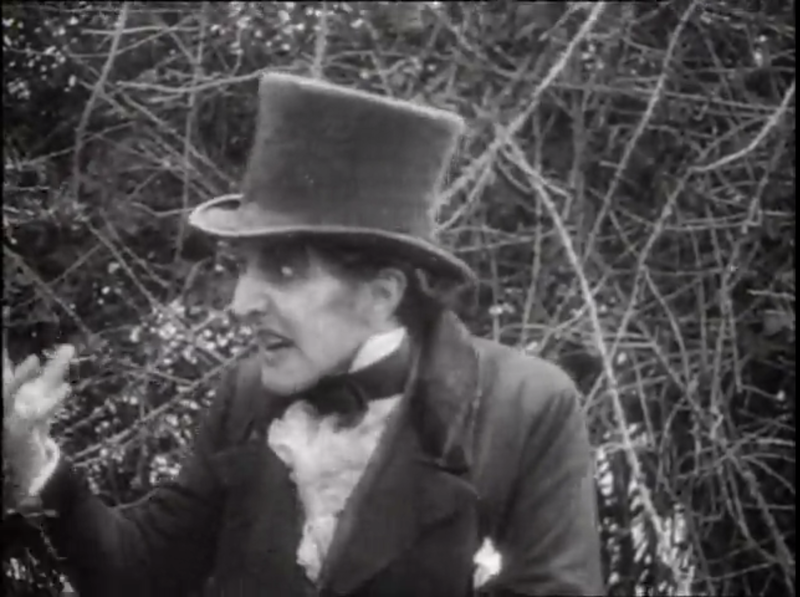 In a mid-shot, he turns around to the camera, and an intertitle appears with a musical stave and the refrain from the folk song “The Farmer’s Boy.” The cut back to Mat shows him singing animatedly before he returns to his ploughing in the shadow of Slievenamon. These on-screen cue might provide the place for Magowan to sing or they might encourage the audience to sing these popular tunes. A similar series of shots occurs later when tailor Phil Lahy sings “The Black Horse,” whose opening lines are printed on an intertitle. Made and released during a fraught historical moment, Knocknagow sought to engage its audiences with a bestselling literary text and popular songs and involve them in the process of readjusting the representation of the Irish on screen. “Court Scene: Clare Cattle Drivers Refuse to Recognise ‘this Concert.’” Dublin Evening Mail 16 Mar. 1918: 3. Jacques. “Knocknagow Filmed: Wonderful Irish Picture of Storied Incident.” Irish Limelight Apr. 1918: 5. JAP. “Gossip of the Day: Film Version of Kickham’s Most Famous Novel.” Evening Telegraph 7 Feb. 1918: 2. —. “Gossip of the Day: The Present Fashion in Films.” Evening Telegraph 27 Feb. 1918: 2. “‘Knock-Na-Gow’ at the Opera House.” Derry Journal 10 Apr. 1918: 4. “‘Knocknagow’ on the Film: A Picture Play that Will Create a Furore in America.” Anglo-Celt 2 Mar. 1918: 6. “Labour’s Protest.” Freeman’s Journal 24 Apr. 1918: 2. The Man About Town. “Thing Seen and Heard.” Evening Herald 22 Aug. 1917: 2; 9 Mar. 1918: 2. NLI (National Library of Ireland). MS 50,000/272/82, Liam O’Leary Archive. Programme for Knocknagow, n.d.
“Opera House.” Evening Echo 14 Mar. 1918: 2. “Proclamation: Processions Forbidden for the Next Three Weeks in the Dublin Area.” Dublin Evening Mail 7 Mar. 1918: 3. “A Round Up: Many Volunteers Arrested.” Evening Telegraph 12 Mar. 1918: 3. “Soldiers & People in Conflict: Scenes in Limerick.” Irish Independent 6 Mar. 1918: 3. “Town Hall.” Galway Express 27 Apr. 1918: 4. “The Untenanted Graves.” Irish Limelight Apr. 1918: 13.